Fireplaces add beauty to any home, but with that beauty also comes risk. Fires can throw off sparks or hot embers, but one of our beautiful fireplace screens can help to protect your home. A fire screen can go a long way in protecting your home. Not sure what fireplace screen to purchase? 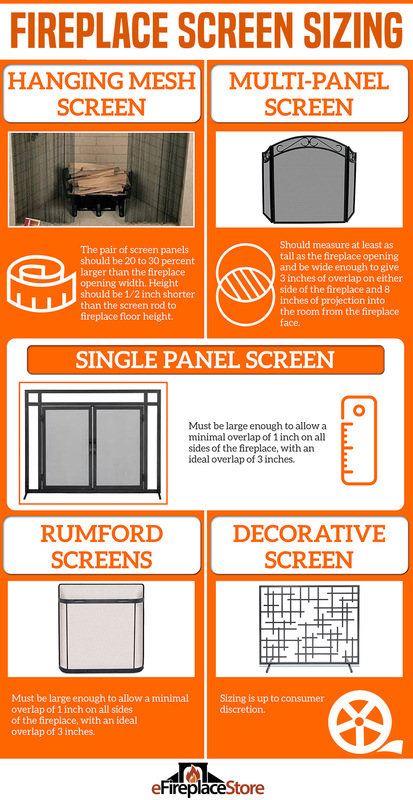 Check out our Fireplace Screen Buyer's Guide below written by one of our fireplace specialists. It will lead you through all tips you need to know to find those decorative fireplace screens and fireplace screens with doors you're looking for. What is the difference between having a glass front or a screen? Is one better than the other? The difference would depend on the unit. It is largely a personal preference for wood pre-fab fireplaces. Although, doors can somewhat effect the burn time. Does the screen need to cover the entire opening of the fireplace? Or, can it be a few inches shy of the top, essentially covering 80-90% of the fireplace opening? Not covering the entirety of the opening should not be an issue; you should be fine with 80%-90% covered. Do you carry glass screens? We do not carry glass screens. How warm do these screens get when sitting in front of a fire? Can you move them to carpet to load more wood? Do you need to use gloves to move? This will depend on the type of fireplace they are sitting in front of. They can indeed get quite hot if exposed for a long period of time to a hot fire. Should the sides be as high as the opening? Ideally, for safety, the screen will cover the entire opening of the fire box. Fireplace screens are a protective addition to any fireplace, as they protect the fireplace surroundings from embers and ashes that may fly out of the fireplace during operation. Fireplace screens come in a variety of shapes and sizes and are made in a variety of materials. Anyone that owns a wood-burning fireplace should have a fireplace screen. Especially those that have carpet nearby or those that have children or pets that need to be protected from getting too close to the fire. Fireplace screens are only necessary when you're actually burning a fire in a wood-burning fireplace. The screen doesn't serve a purpose, other than decoration when there is no fire, nor does it protect from a gas-burning log, which typically does not have embers, sparks, or ash billowing from it. Additionally, a fireplace screen can prevent ash from being tracked all over the home by curious pets who would like to climb into the fireplace to investigate. There are a wide selection of manufacturers in the fireplace screens industry. Pilgrim — Pilgrim has been in business for over 60 years and is currently the nation's best-selling manufacturer of screens. Pilgrim products are heavily built, with sturdy welds and smooth seams. Their fireplace screens are available in a wide variety of colors and styles. These screens are so well-built that the manufacturer proudly offers a lifetime warranty. Cascade — Cascade is a top manufacturer of hanging mesh (coil mesh) screens. They offer an abundant variety of factory-cut sizes, plus the ability to custom produce specialty panels and finishes as needed. Cascade products are manufactured in Tualatin, Oregon, and the company exports its products globally. Uniflame — Originally starting in propane distribution, this manufacturer naturally progressed into hearth accessories and fire pits. Offering a broad range of inexpensive but sturdily built fireplace screens, Uniflame has just the selection for a customer not wanting to spend a bundle. Minuteman — Minuteman is a strong mid to high-end manufacturer of screens. Minuteman produces everything from single panel freestanding screens to multi-panel models, to highly decorative faux screens. Based in Massachusetts, the manufacturer has been a staple for hearth accessories for decades. Fireplace screens come in a wide variety of sizes and materials. Manufacturers usually make screens that consist of anywhere from one to five panels, some folding, some fixed and inflexible. The finishes available are even more broad, including copper, bronze, brass, wrought iron, and steel, just to name the most popular options. Styles are available that suit modern contemporary homes as well as traditional colonial homes and everything in between. You can find the perfect complement to your home décor. Multi panel screens utilize individual framed screen panels connected by full length steel pins. The screen mesh is usually held in place within the frame of each panel. These screens are popular because their installed width can be varied significantly. When shopping for this type of screen, the width is referencing the full side to side measurement of the screen if laid flat on the floor. Generally, your fireplace opening should be 6 inches narrower than the advertised width of the screen to allow for enough angle of the panels so that screen to remains upright. Some multi-panel screens are even available with spreader bars that lock the screen panels in place. This prevents children and pets from knocking the screen down accidentally. Single panel screens with doors are becoming the most popular type of screen for many consumers. This style features a perimeter frame and an internal frame built around one or two operable doors. The screen will feature stabilizers at the base that will hold the screen flat against the face of the fireplace. The screen itself can remain in position at all times, with the doors being opened to tend the fire. Most models have included door handles and magnetic clasps to hold the doors shut. If you have toddlers in the home, it is recommended to anchor the screen to the fireplace with hook and loop adhesive strips. These screens should be ordered large enough so that there is at least an inch of overlap on all sides of the fireplace, with 3 inches being preferred. Hanging mesh screens are a standard screen in manufactured fireplaces and sometimes masonry fireplaces as well. The screen consists of coiled steel wire woven into individual panels. The woven panels will have rings along one edge and are designed to hang from small rod. The screen panels slide back and forth along the rod as needed, much like a shower curtain. 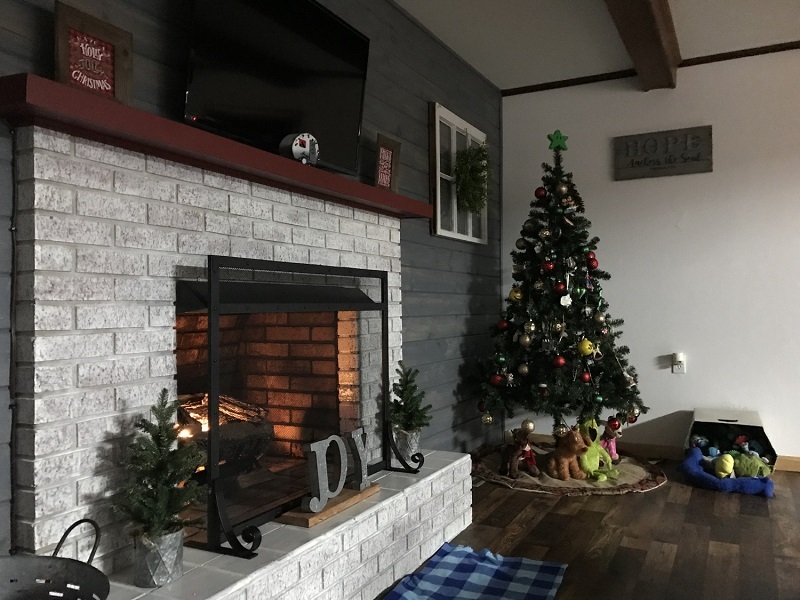 While this type of screen is low cost, there is no rigid barrier like free standing screens and should not be relied upon to keep children or pets out of the fireplace, or stop a log that rolls free from a fireplace grate. When ordering, look for screen panels that are 20 to 30% wider than the actual fireplace opening. This ensures that the screen has the proper draped look when fully closed. Single panel solid screens are similar to single panel screens with doors, but instead, there is only a perimeter frame with a single field of mesh screening. The screens are purposely lightweight and easy to move in order to access the fire. Rumford style screens are a style of hearth that has an opening that is nearly square. These screens consist of a tall perimeter frame and a curved front frame, creating a screen that curves into the room from the fireplace, such as this Pilgrim Rumford Screen. 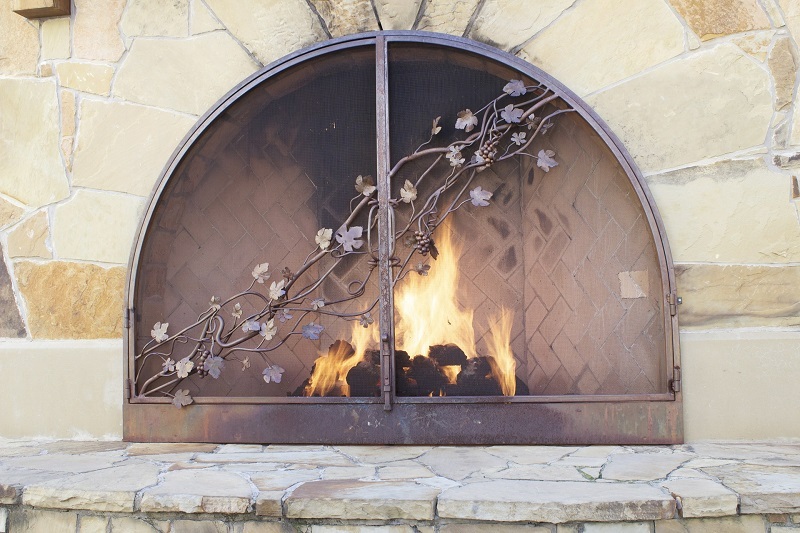 Decorative screens, being those with no mesh or very large openings, are not meant to be used with a wood fire as they cannot prevent sparks or embers from flying out of the fireplace. They work best with inoperable wood burning fireplaces or with gas fireplaces, and they provide an artistic aesthetic while breaking up the dark opening of a fireplace that is not in use. Note: Any time a customer has an operable wood burning fireplace, they need to have a screen. There is no instance of a fire that does not pose a risk to a home, and this risk is increased when burning softwoods or damp fuel logs. Softwoods and damp fuel logs will have a tendency to pop and crack as pockets of moisture are encountered, sending flaming embers flying. A screen is the only barrier to stopping these embers. We recommend leaving a screen in place at all times if pets or children are in the home, as embers can stay hot for up to 24 hours after a fire has "burned out". It's also a good prevention against ash being tracked through the house by an inquisitive cat or dog. While screens of this style are optional for gas fireplaces, direct vent gas fireplaces are required to be sold with a safety screen that covers the glass surface. These screens usually attach to the face of the fireplace to provide additional protection for your loved ones or animals from hot surfaces. There are some elements that you want to look for when picking out your fireplace screen. You want to be sure the legs of the screen are thick and sturdy, to help the screen keep from tipping over. Are there gaps between the screen and any part of the frame the screen is attached to? These gaps could allow sparks to get through and cause a fire. Are the side panels hinged? Having these panels hinged allows for you to position the frame differently depending on your needs. Some screens don't have side panels and are designed to sit flush against the fireplace. While you can use glass doors during the operation of a fireplace, but it is recommended to leave them open for the first 15 minutes of the burn to allow them to warm gradually and prevent shattering from thermal shock. Flying embers and sparks won't have any effect on the glass doors, and a strong enough log impact could possibly break one of the glass panes, but if you are using a grate and not overbuilding the fire you shouldn't have that problem. Glass doors have large enough gaps between the panes for the fire to receive enough oxygen and sealed glass doors will have an air control flap that can be opened to allow oxygen to feed the fire. Some screens have handles. Handles are a very useful feature allowing you to easily move the screen out of the way when you need to tend to the fire. Consider this, especially if you're looking at a screen that does not have hinged doors to access the fireplace. You will want your fireplace screen to be a little larger than your fireplace, though the exact measurements will depend on the type of screen. Multi panel screens should be the height of the fireplace opening, ideally. They should also have enough width to cover each side of the fireplace by 3 inches on either side, while allowing the center panel to stand out from the fireplace by at least 8 inches so the screen doesn't want to tip over. On single panel screens, there should be at least 1 inch of coverage on the top and both sides, with 3 inches being ideal. Hanging mesh screens should be 1/2" shorter than the height of the screen rod to the fireplace floor. The width should be 20 to 30 percent greater than the fireplace opening width. With hanging screens take care to verify if the hanging rings are included in the height of the screen panel. The rings can be 1/2 to 1 inch tall and if they aren't included in the mesh height and you order based just off that mesh height, the mesh could drag the floor. Fireplace screens are typically very easy to install, as almost all screens simply sit in front of the fireplace. This does not mean that there won't be a little assembly, but not all screens will require assembly. Fireplace screens benefit from online shopping and easy shipping. This way both the heavier screens and the ones made of glass can arrive directly to your home without having to pay extra for weight or special handling. If the screen is not very heavy, it will come as a parcel shipment. This does not mean that the screen can't be damaged during shipment, just that you won't have to schedule a delivery for your new fireplace screen. You will still want to inspect your screen for shipping damage as soon as you open the packaging. Fireplace screens can last for many years when they are well maintained. A simple cleaning each season can help to eliminate build up and keep your fireplace screen looking its best for many years to come. Here at eFireplaceStore we have a wide selection of fireplace screens for any homeowner's budget, style and size needs.